Death of Maxentius. 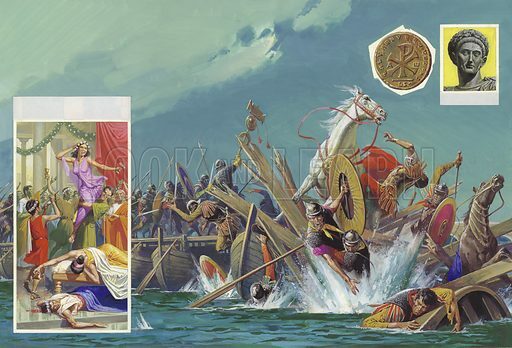 Without warning, the bridge collapsed and Maxentius and his officers were all hurled into the River Tiber and drowned. Constantine was thus rid of his main rival for power in Rome. The top right inset shows a portrait of Constantine the Great who became undisputed ruler of the Roman Empire. The inset to the left of Constantine shows a coin: the symbol on it is a monogram of chi-rho, two Greek letters together representing the name of Christ. This same symbol was painted on the shields of Constantine's soldiers. The lower left inset illustrates the pagan festival Saturnalia. Original artwork for illustration on pp16-17 of Look and Learn issue no 1011 (25 July 1981). Available worldwide for immediate download up to 13,981 x 9,503 pixels.